Went out today again on the second day of our season. Right as it was getting light there must have been 3-4 gobblers on the roost behind me just hammering with 2-3 hens. They would gobble on the roost back and forth for 10-15 seconds at a time. The hens made the worst calls you could imagine and would not win any calling contests but the gobblers sure liked them. I was only maybe 40 yards from them so I got ready. As soon as daylight came they pitched down over the cliff they were perched in and followed the hens to the fields below. As I continue to listen I hear a gobbler really close. I call but he doesn't respond. I figured he was coming in quietly as they often do there. I am waiting and waiting and all of a sudden I hear a put put not more than 3-5 yards behind me. I look at it's a gobbler and he takes off. I try to keep the bead on him in case I get a shot and at 30 yards he slows down and I hit him with the Remington Nitro turkey load 3" #6 and he drops on the spot. 9 1/4 inch beard with inch long spurs. At 6:45 of the second day of our season I am done! Bittersweet as I love to turkey hunt but not complaining either! I am a very blessed man!! Great story and a really great looking bird . What a short season! Congrats! Congrats BC! I fully picture that "Putt" right behind your ear - have experienced that a couple of times. Glad you got an opportunity to squeeze the trigger on him. Congrats again, Bearclaw. I have experienced that "putt" behind me, too! when I turned around to look, there were 4 birds lined up in a row. When I heard the first putt, I instinctively knew I been busted. Wow, you had a great season. Congrats on tagging out! 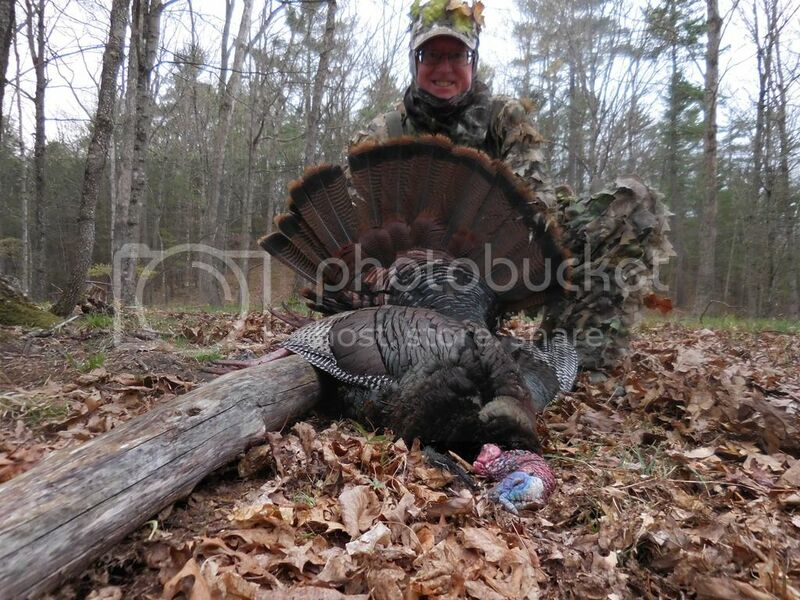 Man life is good...congrats on tagging out on a really nice bird! Sounds like you are having an awesome season. Congrats!! Congrats!! You have had a great season!! Nice job!!! It's great being tagged out on the second day huh?? I tagged out on Wed and both of my buddies were tagged out by Thursday!! Congrats on a great bird. It was a short and fast morning for sure. On the bright side, I know you made it home in time for breakfast.